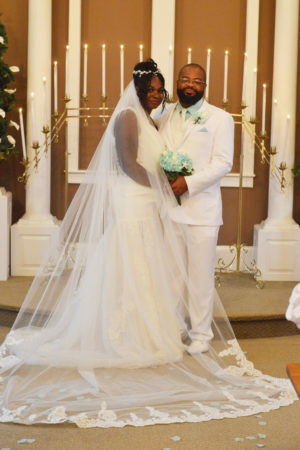 We are happy to announce that LaCosha Shamakia Daniels, originally of Atlanta, Georgia [daughter of Lynn T, Tate and the granddaughter Lynn T. Tate] and Dwane James Wyatt Brooks, originally of Atlanta, Georgia [son of Donald Sye and Sherian & Dan Moore] were united in marriage on Thursday, July 12, 2018 in the Ivory Chapel at Wedding Chapel by the Sea. Reverand Pam Muise officiated. LaCosha’s attendants were her Maid of Honor – Grace Turner of Dover, Delaware and her Bridesmaids – Kiara Daniels of New Jersey and Alice Tate of Atlanta, Georgia. Her Flower Girls were Angelique Campagnini of New Jersey and Ki’Yanna Tate of Dover, Delaware. Dwane’s attendants were his Best Man – Kenneth Brooks of Atlanta, Georgia and his Groomsmen – Jarvis Worthy Jr. of Dover, Delaware and JaVonte’ Worthy of Atlanta, Georgia. His Ring Bearers were Anthony Campagnini of New Jersey and Gianni Gaston of Smyrna, Delaware. After the wedding ceremony, the couple hosted a reception at The Wedding Chapel by the Sea and then the Wedding Party went to the ocean for a Beach Photo Shoot. Congratulations to the happy couple, and thank you from all of us at Wedding Chapel by the Sea for allowing us to celebrate your special day with you!